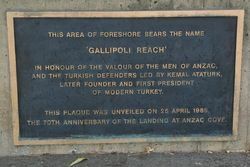 Gallipoli Reach was named on ANZAC Day 1985 to symbolise the battle site in Turkey where Australian and New Zealand forces fought in 1915 during World War One. 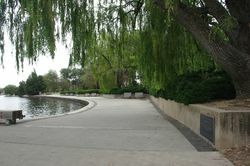 Turkey reciprocated by naming landing site at Gallipoli, ‘ANZAC Cove’. The plaque commemorates the valour of the men of ANZAC and the Turkish defenders, led by General Kemal Ataturk. 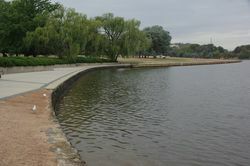 Gallipoli Reach comprises the shoreline of Lake Burley Griffin, between Nerang Pool in Commonwealth Park and Aspen Island in Kings Park. THE 70TH ANNIVERSARY OF THE LANDING AT ANZAC COVE.